In four stories across two issues, writer Josh Trujillo and a group of talented artists take a wide-ranging and surprising look at how technology has affected every aspect of our lives. Not surprisingly, given the speed at which the world is changing, the comics shelves have seen quite a bit of work on the theme of how technology is affecting our personal relationships. For example, in the past few months alone we’ve had Alex + Ada from Image and A Boy and A Girl from Dark Horse. 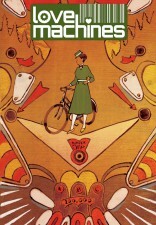 However, what makes Josh Trujillo’s anthology comic Love Machines so refreshing is that he looks backwards as well as forwards. 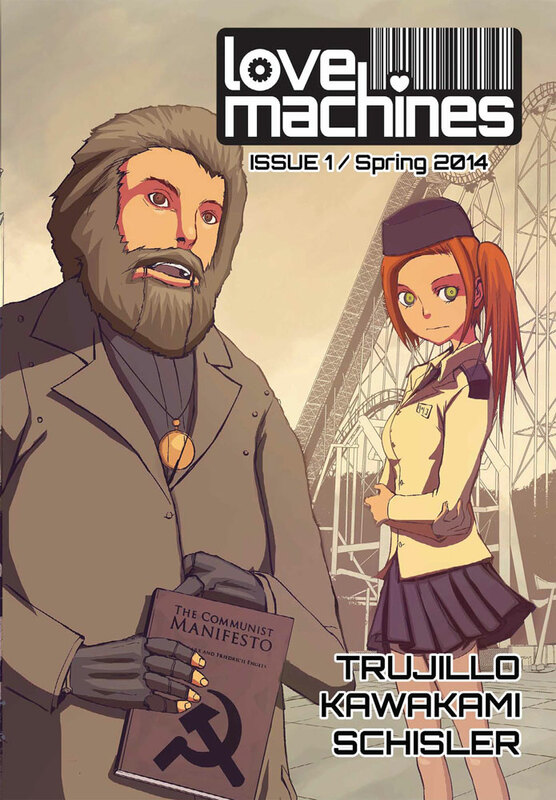 So in the four stories across these two issues (written by Trujillo and illustrated by a slate of collaborators), bikes, microwave ovens and pinball machines take the place of the more usual sexbots and teledildonics. 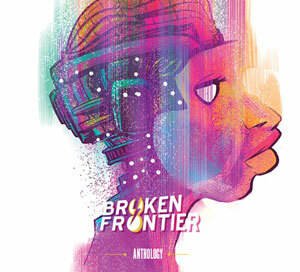 Both of the issues published so far follow a similar pattern, with a longer, more substantial story and a five-page back-up, along with a text page on which Trujillo expands on the themes explored in the comics. In #1, the main event is ‘Workers of All Lands, Unite’, a manga-styled collaboration with Japanese artist Ryo Kawakami, in which Risuko, a young woman working as a “Gratitude Hostess” at SunSunFunLand (“Japan’s most beloved pop vacation resource”) undergoes a political and personal awakening through her exposure to an animatronic Karl Marx. 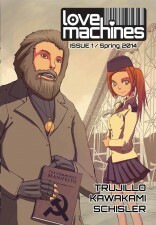 Trujillo draws on his experience of working at a theme park to deliver a scalding satire on the ironically robotic adherence to cultish corporate dogma, while also hailing the ability of individuals to throw off their chains and stage even a mini-revolution against dehumanising working conditions. Meanwhile, Kawakami’s unmistakably Japanese art suits the specifics of the story perfectly, while allowing its universal message to shine through. The back-up strip in #1, ‘Old Appliances in Love’, with art by Michael Schisler, is an energetically cartooned vignette about a microwave oven and an obsolete vending machine falling in love in a school staff room. However, the challenge of persuading the reader to invest in their relationship is perhaps a step too far, and the story is a bit of a disappointment after the strong main feature. #2, behind a lovely cover by SM Vidauri that references the two stories within, leads off with ‘The Velocipede’, illustrated by Ben Bishop. 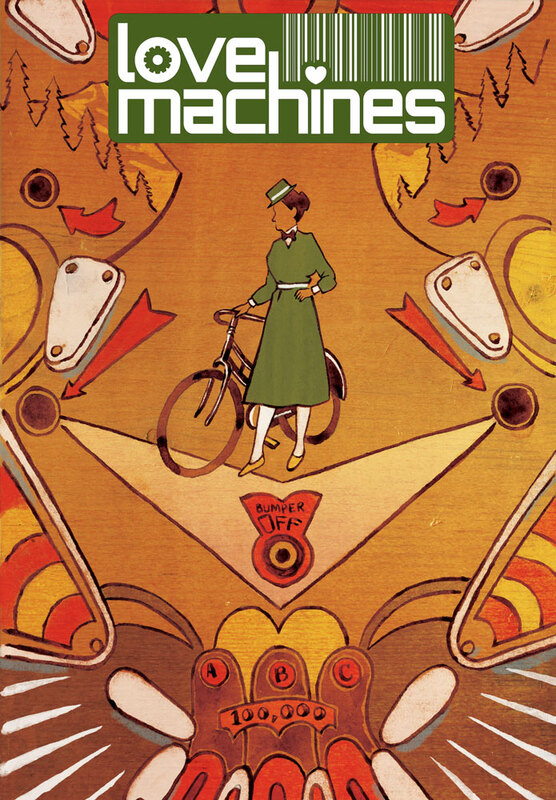 Set in rural Colorado at the turn of the twentieth century, it highlights what a social transformation was effected by the arrival of the bicycle – especially for women, who gained a degree of independence that had previously been denied to them. And, as Trujillo outlines on his text page, the patriarchal opposition that the female cyclists roused galvanised them into banding together and resisting, forging a degree of political will that led the way for the organisation of the suffrage movement. Bishop’s work on the story is very expressive, creating a palpable sense of time and place. A couple of telling little details get a bit lost in the art, but the strength of Bishop’s characterful portraiture gets it through. The five-page back-up here is ‘Solenoids’, illustrated with a light touch by JB Wolfe and based on a man’s relationship with a ‘feminised’ pinball machine. This is considerably more intriguing than the short in #1, with oblique references to domestic violence and patterns of abusive behaviour (as well as the same old excuses). Trujillo and his collaborators maintain a high standard and an appealing diversity across these stories, and Adam Pruett also deserves a mention for his fine lettering, which maintains the comics’ professional feel. This is a very promising project that could go in any number of directions. I look forward to seeing where Trujillo and company head next.